I didn’t go on an all-pumpkin diet to find the best-of-the-best pumpkin recipes for you this season, but I did subject my family to more pumpkin these last few weeks than most would think reasonable. What was the result? Some incredibly delicious recipes that I just had to share. The “pumpkin spice” trend has caught on for good reason - it goes well with almost everything. As you’ll see, there’s a recipe below for every meal between breakfast and dessert! 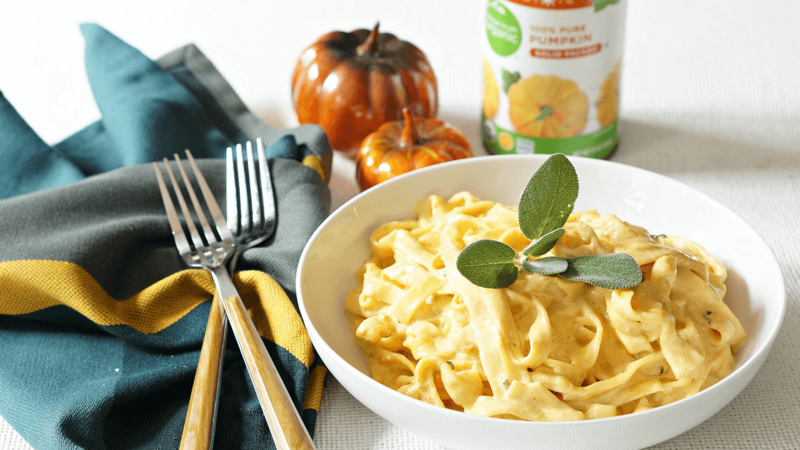 From the most divine pumpkin alfredo pasta dish to the best fudge I’ve ever made, there’s a pumpkin dish in here for all to love. 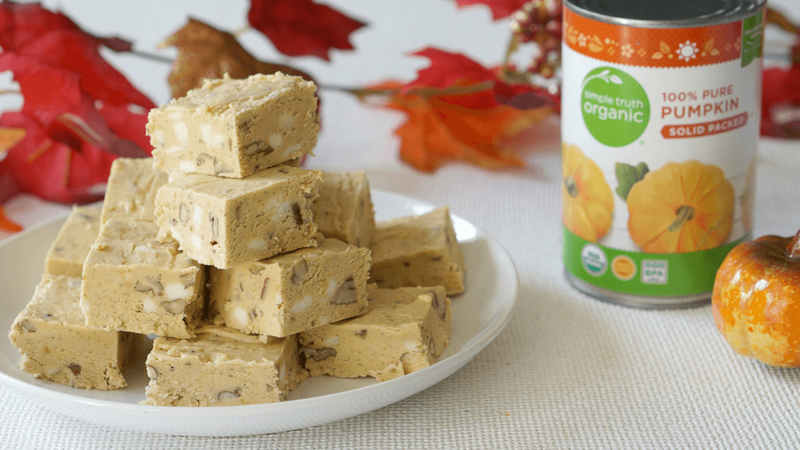 Whether you define the start of fall as the day Starbucks releases their Pumpkin Spice Lattes or you hold out for the real deal, the holiday pumpkin pie, you’ve gotta try these four pumpkin recipes. Each is easy to make, with ingredients available at your local Harris Teeter. Preheat the oven to 400 °F. Line a baking sheet with parchment paper. Mix apple and garlic cloves with olive oil, then pour out onto the prepared pan. Bake for 15 minutes. Meanwhile, place the pumpkin in a microwave safe dish and cook until hot. (Place a paper towel over the dish while cooking to avoid splatters.) Add warmed pumpkin and hot apples and garlic, cayenne, salt and pepper to a high-speed blender. Pour in the vegetable stock and puree until smooth. 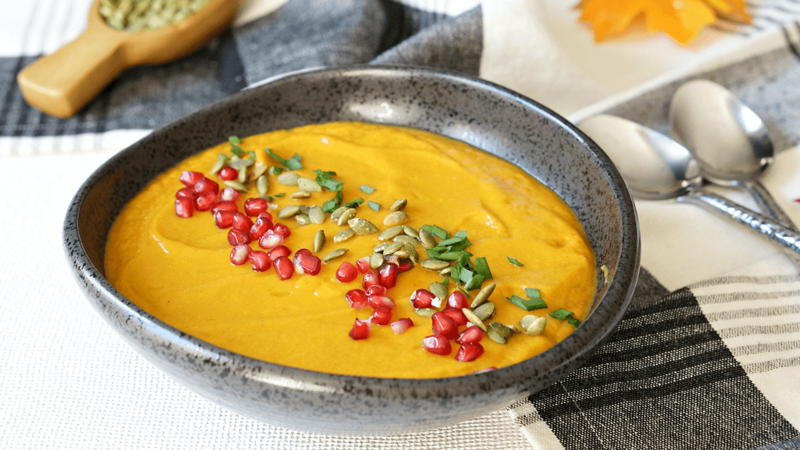 Serve with pomegranate arils, pumpkin seeds and chopped chives, if desired. Sift together the flour, baking powder, pumpkin pie spice, cinnamon and salt into a large bowl. In a separate bowl, whisk together the milk, pumpkin sugar, eggs and oil until smooth. Pour the wet ingredients into the flour mixture and stir until just combined. Heat a griddle to medium heat and coat with cooking spray. Ladle out ¼ cup batter per pancake and cook until bubbles form around the edges. Flip and cook until browned on the bottom. Repeat with remaining batter. 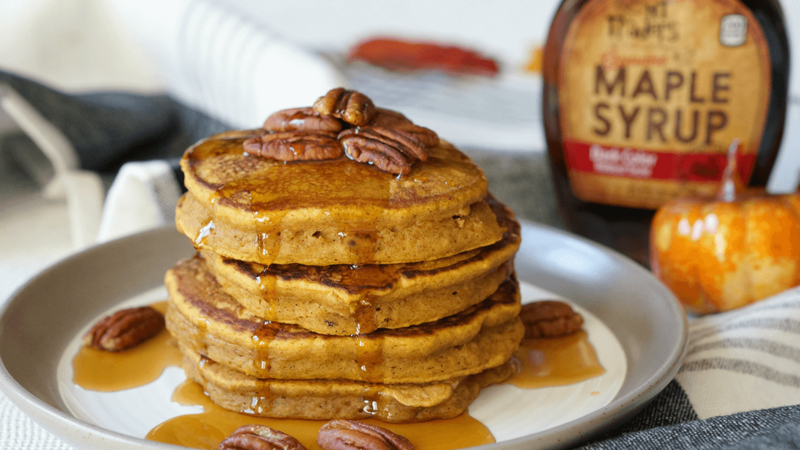 Serve immediately with maple syrup, butter and pecans. In a large skillet, melt butter over medium heat then add garlic and sage to the skillet. Sauté until fragrant, about 1 minute. Add the pumpkin and cream. Simmer until thickened and is just about to boil. Turn off the heat and stir in the cheese. Toss the pasta with the sauce and serve immediately. Garnish with extra sage leaves, if desired. Line a 9x13 baking dish with aluminum foil extending over the edges. Spray the foil with cooking spray. Remove the pan from heat and stir in the remaining ingredients. Mix until well blended, then pour into the prepared pan. Allow to rest until the fudge comes to room temperature, then cut into squares.